Hi stamping friend! I’m here today to share another Charming Cafe card with you. This card is much less ‘involved’ than the first one I shared with you IN THIS POST. That card was a tri-fold, and used multiple layers of the Cafe Builder Framelits. Today’s card is a regular fold, and only has a bit of die cutting, and a watercolour wash.
For this card, I only die cut the table and chairs scene. A simple Whisper White cardstock base is used for this card. 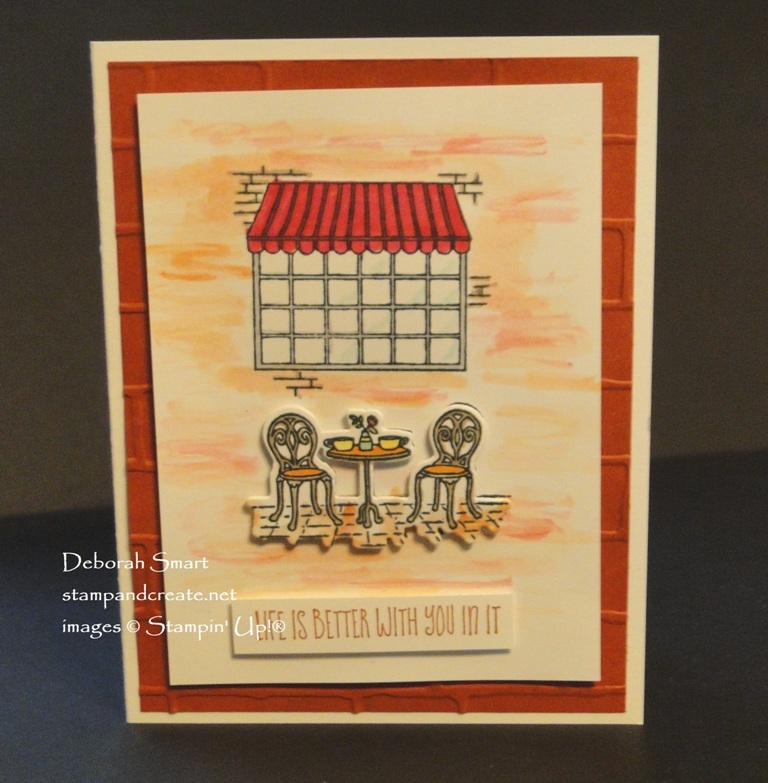 The next panel is Cajun Craze cardstock, embossed with the Brick Wall Embossing Folder and Big Shot. On the panel of Whisper White, stamp the window from the Charming Cafe set in Memento Tuxedo Black ink. Colour in the awning with the Cherry Cobbler Light Stampin’ Blends Marker, and add some reflection to the glass by adding a touch of Pool Party to some of the window corners, with the Pool Party Light Blends Marker. Create a background wash using an Aqua Painter and pick up ink from the lid of the Cajun Craze ink pad. Having some areas darker than others creates a bit of depth, and gives the look of ‘old brick’ siding. Next, stamp the table and chairs onto a separate piece of white cardstock in Memento black ink. Use the Blends Markers in Pumpkin Pie, Daffodil Delight and Pool Party to colour the scene, and bricks. 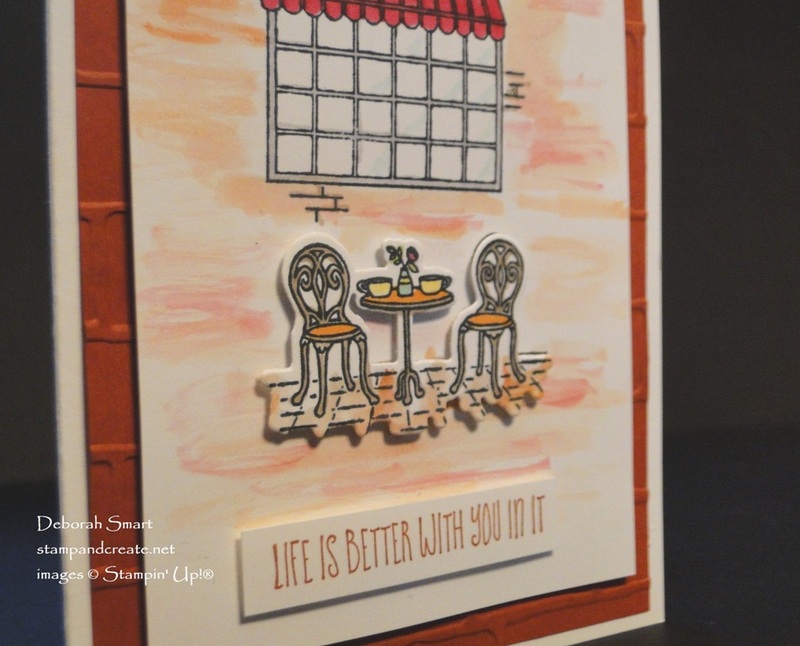 Die cut the table & chairs with the Big Shot and Cafe Builder Framelits, and attach them to the card front with Stampin’ Dimensionals. Stamp the sentiment in Cajun Craze ink onto a scrap of white, and attach it under the chairs, with Dimensionals. I highly recommend purchasing the Bundle, which is the stamp set and framelits together. Not only do you save 10% (and your sanity, by avoiding a lot of scissor work!) but you’re going to love the different scenes you can create with the combination. This card reminds me of Paris and sitting outside drinking a glass of wine. Great card! The only thing better than a cup of coffee, Susan – a glass of wine!! 🙂 I haven’t been to Paris (yet) but I like your style! So pretty, Deborah! I love the “old brick” wall. Sweet card.